The Battle of the Philippine Sea, an epic naval aviation battle which pitted the Imperial Japanese Navy’s 1st Mobile Fleet against the American Navy’s Task Force 58. What eventually transpired over the course of the battle has been recognized as the last great carrier battle of WWII. The Japanese commander, Vice Admiral Ozawa commanded the 1st Mobile Fleet of the IJN. Vice Admiral Marc Mitscher (USN), commanded Task Force 58 of the American Navy. During one of the last actions of this multi-day battle, Mitscher made the decision to launch his bomb and torpedo squadrons in the late afternoon of 20th June 1944. With only 75 minutes of sunlight remaining, Mitscher gambled and caught Ozawa’s fleet at the last know position, just at the limits of his force. The range and timing of this nearly suicidal mission would exceed many of the bombers outer limits. But they would catch and destroy a good portion of the Japanese Navy’s 1st Mobile Fleet in the closing twilight of this momentous day. At 16:30, an assortment of 77 dive-bombers, 54 torpedo-planes and 85 fighters of TF58-1 (USS Hornet & Yorktown) launched from the decks of the American carriers to attack the Japanese. The launching of 216 aircraft was completed in the remarkably short time of eleven minutes. 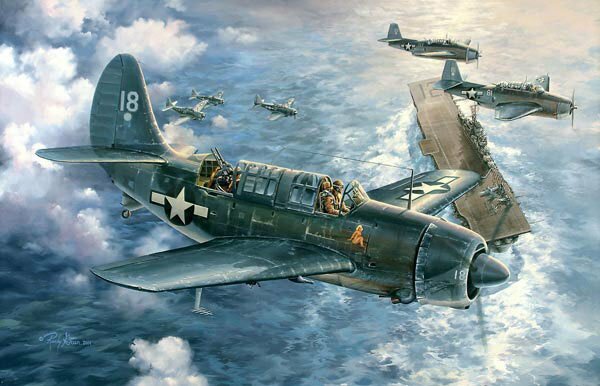 In this painting by Randy Green, we see the last elements heading off to join the strike force already en route to the position of the Japanese fleet. Admiral Ozawa had very few planes with which to fight back and his ensuing losses were severe. The carriers ‘Hiyo’, ‘Zuikaku’ and ‘Chiyoda’ were hit. The battleship ‘Haruna’ was also hit. The Japanese lost a further 65 planes and by the end of the attack, Ozawa’s fleet had a scant 35 planes left. The total American loss in this attack over the Japanese fleet was 14 planes. Ozawa realized that he had no hope of continuing the fight and retreated to Okinawa. He had lost 375 planes during the course of action. The problem the American aircrews now experienced was getting back to the carriers as darkness was falling and few pilots were trained to land in the dark. They had flown 275-300 miles to the enemy fleet and had almost as long a return flight to the US carriers. Their fuel was therefore dangerously low. At 20:45 the first returning planes began to circle over Task Force 58. Vice Admiral Mitscher broke all the rules imaginable, he showed great concern for the safety and well being of his flyers and made the decision to fully illuminate the carriers, despite the risk of attack from submarines and night flying aircraft. All ships of the task force turned on their lights, and the screening destroyers fired star shells throughout the recovery, which lasted two hours. It was the American fleet’s good fortune that no carrier fell prey to Japanese submarines despite illuminating their decks. Unfortunately, eighty of the returning aircraft with pilots, neither trained nor equipped for night landing, were lost. Some crashing on flight decks and the majority ending up in the sea. But of the 209 aircrew participating in the 20 June strike, 160 were rescued either during the operation or in the following few days. The Japanese still had carriers but very few planes to operate on them. More important, they had few aircrew who had much combat experience. A carrier fleet without planes and competent pilots was useless. The Air-Action during the Battle of the Philippine Sea effectively ended whatever carrier strength the Japanese Navy had and proved to be an overwhelming victory for the American Navy.